HDTV antennas are pretty much the greatest thing that ever happened to cord cutters. Companies are finally beginning to offer streaming TV solutions and services like Netflix and Hulu are great, but all that costs money. Meanwhile, with a simple HDTV antenna, you can get live TV in full 1080p HD from all of the major networks and dozens of other channels… all for free. Why on Earth would anyone pass that up? Well, there is one downside to getting free TV this way: HDTV antenna are generally pretty ugly, and you usually have to mount them on a window or someplace else that’s very visible. But guess what — there’s another solution out there, and it’s a brilliant one. 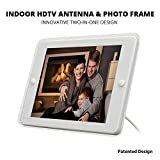 The ANTOP Photo Frame Smartpass Amplified Indoor HDTV Antenna looks like a regular old picture frame from afar, but it’s actually a powerful HDTV antenna that picks up crystal clear live TV and feeds it to your screen at up to 1080p. For free. Forever. Free TV for Life! No monthly bill for watching TV! The AT-204BWHDTV Antenna receives free broadcast High Definition Over-The-Air TV signals, such as ABC, CBS, NBC, PBS, Fox, Univision and others. 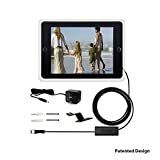 Compatible with TV converter boxes or digital TVs/4K Ultra High Definition (4K UHD) TVs. Engineered and designed in the USA by ANTOP, the antenna specialists, the ANTOP Photo Frame AT-204BW over-the-air digital TV Antenna features a 40 to 50-milemulti-directional reception range from point of signal origination. The compact size allows you to position the antenna anywhere in your home. The white frame fits a 4″ x 6″ photo. The Smartpass Amplifier, an exclusive technology offered only by ANTOP, uses an all-in-one design to allow an easier connection and deliver the correct balance between short and long range reception. ANTOP was the first antenna manufacturer to include a built-in filter in all their products to block 3G and 4G wireless signals to ensure noise-free digital TV reception. All ANTOP products come with 24-hour access to on-line customer support and installation assistance. ANTOP products include a 12-month warranty and 30-day money back guarantee. Visit http://www.antopantenna.com for complete Warranty, Return and Replacement details.